The technology is, therefore, a century old, and it is used world wide. Nevertheless, it is still unknown to many US state and local regulating agencies, who continue to view chlorination as the only acceptable way to purify water. Lamp output depends on the concentration of mercury within the lamp, and the concentration depends on pressure. Low pressure lamps (called LP), the most common, produce UV light primarily at 253.7 nm, an ideal treatment wavelength. Some newer lamps are called “low pressure/high output” (LPHO) and some applications now use mixed vapor lamps called “amalgam” lamps. These require more electrical input and generate more UV output. LPHO lamps are roughly twice as powerful as LP, and amalgams may be about four times as powerful as LP. 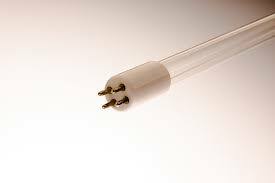 The lamp itself is inside a transparent tube called the“quartz sleeve,” which protects it from contact with the water, and on the other side of the sleeve there is normally a metal reflective chamber. The water enters one end of the chamber, flows past the lamp to exit at the other end, and is in the process exposed for some time and at close proximity to the UV dosage put out by the lamp. UV dosage is typically measured in units called “Joules,” and it is most frequently expressed in terms of “mega Joules per square centimeter,” or mJ/cm². (Microwatts per second per square centimeter, expressed as µWs/cm2, and mJ/cm2 represent the same dosage and the two systems are used interchangeably.) The higher the number, the higher the dosage. Also a factor is general absorption of the UV light for unintended purposes. UV makers usually require that the water have less than seven grains per gallon of hardness, less that 0.3 ppm iron, less than 0.05 ppm manganese, and that it be generally clear and free of particulate and tannins. All of these can create situations where the light is absorbed and, therefore, its anti-microbial activity is diminished. Hardness, for example, can form scale on the outside of the quartz sleeve which blocks the passage of light. The main disadvantage of UV as germicidal treatment is that it has no residual effect. Bacteria are treated when they pass the lamp, but contamination that occurs downstream of the lamp is not treated. Chlorine and chloramine, by contrast, stay in the water from the point of treatment to the final point of use, preventing reinfection. The need for a constant supply of electricity can be seen as an additional disadvantage. If the power goes out, you shouldn’t use the water. 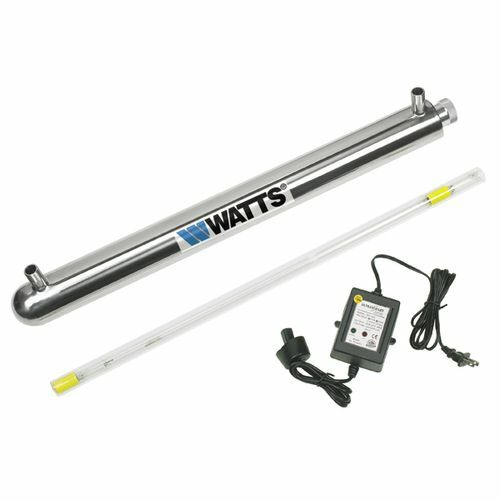 Modern UV units often included devices to warn of power failure or even to shut off the flow of water if the power goes off. Classic Plastic Pura Units. We’ve been in business almost 30 years, and Pura was one of our first products. We started selling plastic-housing Pura UV systems just a couple of years after Pura went into business in the late 1980s, so it’s a product dear to our hearts. The Pura #20 lamp, used on all whole house plastic units, is, in fact, our most successful product in terms of sales. We stock all units and all parts, “every nut and bolt,” of plastic housing Pura units. We have an entire website, http://www.purauv.com, devoted to plastic-housing Pura units. We’re the best source, anywhere, for plastic Pura units and parts. We have some expertise with the units and can help with service issues. Stainless Steel Units. We have stainless units both by Sterilight and Trojan. We stock parts for both Watts and the now-discontinued Pura stainless steel units. Sterilight stainless units are now on our main website. We are factory-direct distributors for Sterilight and Trojan and can supply any replacement parts you need. This article first appeared in the Pure Water Occasional for May 2011. The current version is updated and revised.